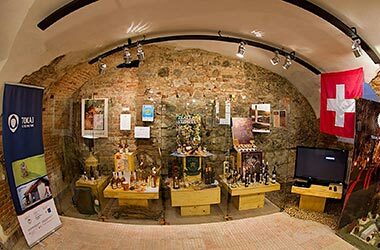 In the village is a house of traditions, which is a collection of folk traditions, exhibition of traditional housing and crafts, working tools, press for grape processing with the possibility of demonstrations weaving and baking bread. It is a multifunctional building with the exposition, sanitary facilities for visitors also an oven for baking bread and preparing food. In the village is a house of traditions, which has a collection of folk traditions. Collection includes work tools and press for grape processing. Multifunctional building is equipped with an oven for baking bread and preparing food. Collection of samples includes the possibility of weaving and baking bread.